‘Tis the season to traditionally spend with family and friends and this year Americans are traveling in record numbers. AAA forecasts 4.5 million New Englanders will take to planes, trains, automobiles and other modes of transportation during the year-end holiday period from Saturday, Dec. 23 through Monday, Jan. 1. This will be the highest year-end travel volume on record and a 2.6 percent increase in travel volume compared with last year. 2017 marks the ninth consecutive year of rising year-end holiday travel. 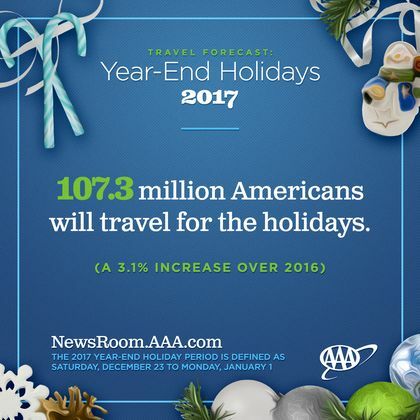 Nationally, AAA forecasts 107.3 million Americans will travel between Saturday and New Year’s Day, the highest on record and a 3.1 percent increase from last year. For the Americans traveling by automobile, INRIX, a global transportation analytics company, in collaboration with AAA, predicts travel times during the holiday week could be as much as three times longer than the normal trip. Automobiles: The majority of travelers - 4 million - will hit the road (a 2.4 percent year-over-year increase). Planes: 400,000 people will travel by air, a 4.7 percent increase and the fourteenth year of consecutive air travel volume increases. Trains, Buses, Rails and Cruise Ships: Travel across these sectors will increase by 1.6 percent to 132,000. Based on historical and recent travel trends, INRIX expects drivers will experience the greatest amount of congestion before the holiday week – on Wednesday, Dec. 20 and Thursday, Dec. 21 – in the late afternoon as commuters leave work early and mix with holiday travelers. For example, drivers in Boston could see travel times peak at three times a normal trip between 3:30 and 5:30pm. As North America’s largest motoring and leisure travel organization, AAA provides 58 million members with travel, insurance, financial, and automotive-related services. Operating 19 offices throughout Maine, New Hampshire and Vermont, AAA Northern New England is a not-for-profit, fully tax-paying corporation and a leader and advocate for the safety and security of all travelers. Today, AAA members benefit by roadside assistance, insurance products and services, travel agency, financial products, automotive pricing and buying programs, automotive testing and analysis, trip-planning services, and highway and transportation safety programs..